Two years after it was launched, Niagara Health's Integrated Comprehensive Care (ICC) program has experienced extraordinary success in helping hundreds of people manage their chronic conditions at home. The program provides discharged patients who have chronic obstructive pulmonary disease (COPD) or congestive heart failure (CHF) with access to care in the community. Over the past two years, our ICC program has been among the best-performing in our Local Health Integration Network in several areas. We have decreased length of stay in hospital by three days and reduced readmissions and unanticipated Emergency Department and Urgent Care visits for ICC participants by more than 10 per cent. 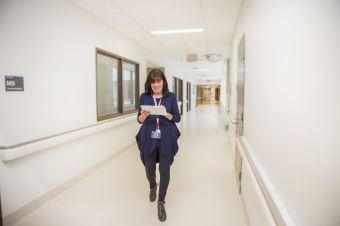 “This means we are providing resources and support in the community for our patients to manage their chronic condition at home, rather than coming to hospital,” says Heather Paterson, Niagara Health’s Director of Patient Care and Integrated Comprehensive Care project lead. More than 900 patients have benefited from the program since it began in April 2016. Instrumental to our success is the commitment of our ICC co-ordinators, who work with patients after they are discharged home and connect them with service providers in the community, including home care. ICC co-ordinators work with patients to create action plans to manage their conditions at home. Patients and their family members have access to support on a 24/7 basis for 60 days after discharge. Our Mental Health and Addictions Program recently launched its own ICC program called Wellness Recovery ICC. Staff will work with patients to support individual recovery needs and to assist with skill building that will help them manage wellness in the community and reduce Emergency Department visits and hospital readmissions.